This pretty Maxy Aquini doll by Gotz is 42cm tall and she makes a great bathing doll for children ages 3+. Her hair is styled in two pigtails and a fringe framing her face. 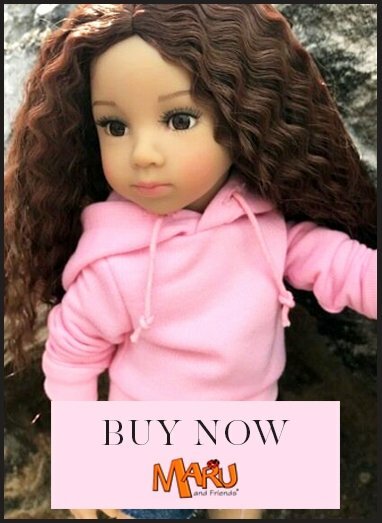 The hair is sewn into the doll's head and is very durable. Children can easily wash it, comb it and style it. The creativity of your children will be limitless. Maxy Aquinis have a vinyl body which which can be immersed in water. Children can easily undress them or put their clothes back on. She sits and doesn't stand and her hair is sewn into her doll head and is very durable. Children can easily wash it, comb it and style it. The creativity of your children will be limitless with this water baby doll, and all the accessories. A Maxy Aquini doll has closing and opening eyes. There are many extra clothes available for this size, which is the 42-46cm size, also known as medium: M.